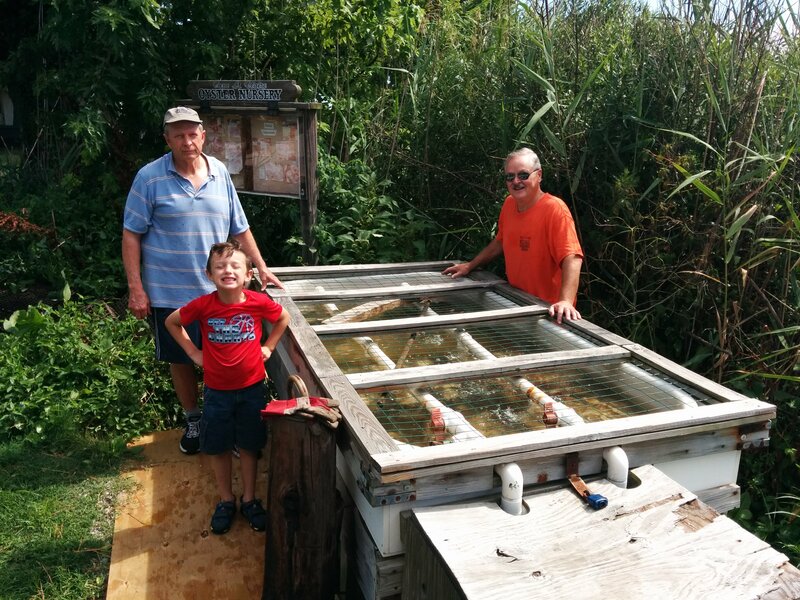 The Magothy River Association and Cape St. Claire have operated the Oyster Nursery on the shores of the Little Magothy River for nearly twenty years. Serving as both an educational installation and an integral part of the Marylanders Grow Oysters Program, the nursery provides local families with a hands on opportunity to experience the life cycle of our native oyster. From Spring to Fall, the happy sound of gurgling water greets curious children and appreciative adults alike, as the juvenile oysters mature quickly in the special care provided by the nursery. Scores of homeowners meet there each September to pick up their own annual crop of new baby oyster spat. These generous volunteers host the spat for the next ten months, tending from three to six cages full, which are suspended beneath their home piers. In June, these “home schooled” oysters are taken by the volunteers to one of the historic reefs being restored in the Magothy River. It’s a beautiful way to appreciate and contribute to the revival of one of the most important and most endangered Chesapeake Bay native species.